Ink cartridge is designed for use with the Epson Stylus C80, C80N, C82, C82N, C82WN, All-in-one Epson Stylus CX5200 and CX5400 printers. DuraBrite inks produce bold black text and rich, vibrant colors. Acid-free ink offers superior resistance to water, fading and smudging. 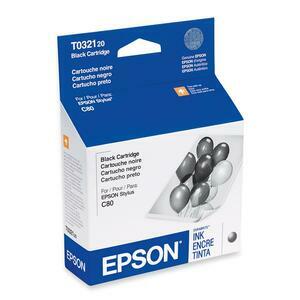 Ink cartridge is excellent for double-sided printing because inks do not bleed through.